Quick Play = Quick Profits! Our Most Popular, Highest Earning Ball Drop Title — a MUST for every game room! Players skillfully time the ball drop to earn ticket values as displayed on the rotating wheel, a multi-play bonus ticket extravaganza, or win the cumulative Monster Jackpot of tickets with a single bounce! 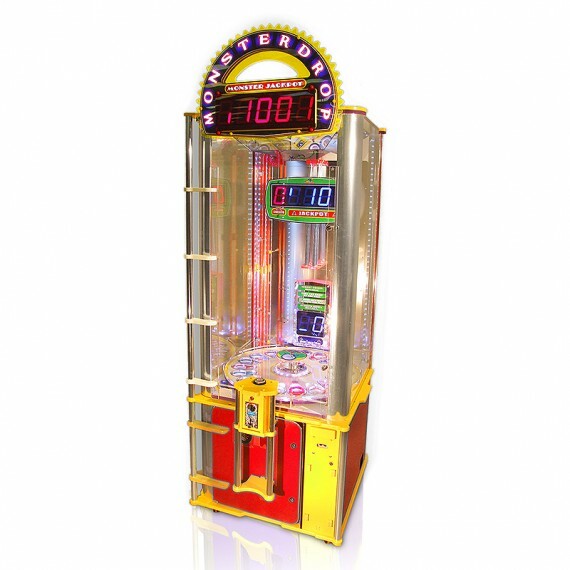 Pair with Explosive or Pop It Win Units to enhance the presentation and inflate revenues!Time the drop of the high-energy ball so it falls through the win zone holes on the spinning wheel below. If a ball drops in an additional bonus ball hole, balls are reserved until – if you make it – into a drop bonus balls hole. It’s a multi-play extravaganza! Bounce a ball up onto the platform and in the hole for a huge two-player cumulative instant winner bonus.